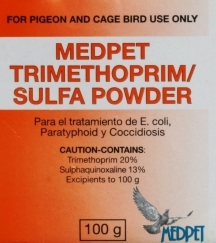 This antibiotic is used for treatment of Coccidiosis and E.coli enteritis in cage and aviary birds. Mix ¼ teaspoon per 1 liter/quart of drinking water. Treat for 10 days. Mix fresh daily and remove all other sources of water or moisture during treatment period. This would include all moist foods such as vegetables, fruits or greens. Bath water should contain medication also, or be withheld during treatment period.